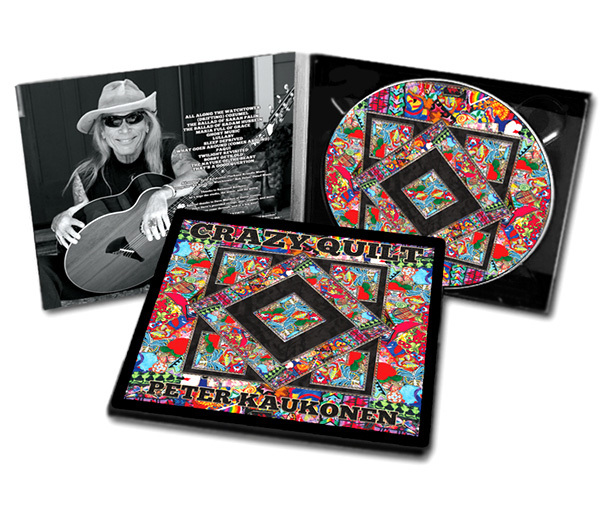 PETER KAUKONEN, San Francisco Bay Area guitarist, has played, toured, and recorded with Black Kangaroo, Jefferson Airplane, Jefferson Starship, and Johnny Winter. He continues to compose and record the kinds of eclectic and personal music that has attracted and sustained legion of stalwart fans through the years. Now he is pleased to showcase projects spanning the decades, from Black Kangaroo in the 70s to his most recent releases "Going Home" and "Beyond Help!" These projects feature his acoustic and electric guitar virtuousity while showcasing his skills as a composer and producer. Highlighted by emotion, driven by passion, and frosted with whimsy, this is music that's guaranteed to take you on a trip. You can sample music from different projects, check out photographs, read the editorials, and make purchases in these pages. Peter Kaukonen was born in 1945. His father was a diplomat, a talent that seems to have passed Peter by. He grew up in Pakistan and the Philippine Islands and has lived in strange and exotic places like Sweden, Iowa, Italy, and New Jersey. His family was musical and literate, their tastes eclectic, but listening to their records of music from Bach and Bali was nothing like listening to the sounds that he heard coming off of the streets in Karachi. He finished high school in Connecticut, where he started playing guitar, teaching himself to flatpick and fingerpick folk music and blues. In 1963 he moved to California to attend Stanford University. He majored in biochemistry, human sexual behavior, and primitive music, not one of which appeared on the curriculum. He played the Bay Area folk circuit with folks who went on to become the Quicksilver Messenger Service, the Grateful Dead, and Jefferson Airplane. He has played, toured, and recorded with Johnny Winter, Jefferson Starship, Jefferson Airplane, Hot Tuna, Link Wray, and his own Black Kangaroo. Recently "Don’t Fret" became words to live by when arthritis rendered his fretting hand hors de combat for four years. He dealt poorly with the ensuing existential challenges, but recent surgery has corrected the crippling conditions, and he continues composing his deeply personal, engaging, challenging, and eclectic music, which he records in his own facilities. He lives with his wife and twin sons in Mill Valley, California, where he bicycles preposterous distances on and off the road and takes great pleasure in growing roses. His boys will be entering the fourth grade; how time passes! People say that having children will keep you young, but Peter thinks it just keeps you tired and irritable. Peter plays Charvel-Jackson electric guitars and Santa Cruz and Kauffman acoustic guitars.